Home Resources Quick Reads Technology Solutions Hardware Support Services Is It Time for a Hardware Refresh? Is It Time for a Hardware Refresh? Do you know what old hardware is really costing you? We all want to get the most from our hardware investments. If you think back over the life of Microsoft, each time there has been an Operating System (OS) upgrade there was a need to upgrade the hardware to handle the requirements of the new OS. Each update along the path — beginning with MS-DOS and ending up at Windows 10 – has called for a hardware upgrade—often a significant one. 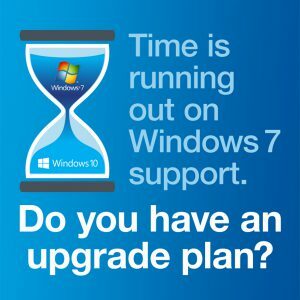 Today, for the most part, if you have adequate hardware for Windows 7, you may have adequate hardware for Windows 8 and 10. This has allowed people to forget that not only do Operating Systems “expire,” but so does the hardware. Ten to fifteen years ago, a three-year lifecycle was all that was expected out of hardware. Today, hardware has improved, becoming faster and more reliable. To a point. There are a number of reasons why a 3-year life cycle is still a good rule of thumb. Microsoft historically ran on a 2-year cycle for major OS upgrades, giving you one year for them to get the bugs out before you upgrade. (We’ll see what happens as the Windows 10 subscription model evolves.) Each OS is significantly more secure than the previous version. Certainly there are patches being applied, but a patch is never as good as something built from the ground up to take care of the issues. New products and software are not necessarily backward compatible, i.e., printers, scanners, and off-the-shelf software. New Operating Systems take advantage of the new hardware features in processors, security, encryption, etc. New hardware is faster and has more capacity. Old hardware is more mechanical and, as such, breaks more. Old hardware has a defined MTBF (Mean Time Between Failures) of three years. After that, you are on borrowed time for all components in the system, for example, fans, drives, system components. Newer hardware configurations make better use of space; for example, All-in-Ones and small form factor PCs as well as a whole host of new laptop/tablet options. EXCEPTION: If your old hardware is a laptop, you should be on a two-year cycle. When you consider the cost of downtime, administration and maintenance, the cost of a new PC is far cheaper. Just one downtime instance/service call may be more expensive than the cost of a new PC. A uniform network will have fewer “weird” issues, whereas a patchwork of device models might result in conflict over a driver or not act the same with security software. Servers suffer the same issues, and maybe more so, since their reliability is so critical. It is far easier and cheaper to migrate to a new computer than to upgrade an existing PC. Hardware is typically sized capacity-wise for three years for disk, RAM and processor. The cost of PCs has stayed relatively the same for years. It is just the capacity and speed that keep changing. When you consider that hardware cannot, and should not last forever, and that it’s a budget item to replace every three years, you’ll discover that downtime is drastically reduced, security is improved, and you won’t be dealing with out-of-cycle upgrades. Contact us to plan out your hardware migration and devise a budget plan for your organization. We’ll develop an IT lifecycle plan that keeps you productive, competitive and secure.